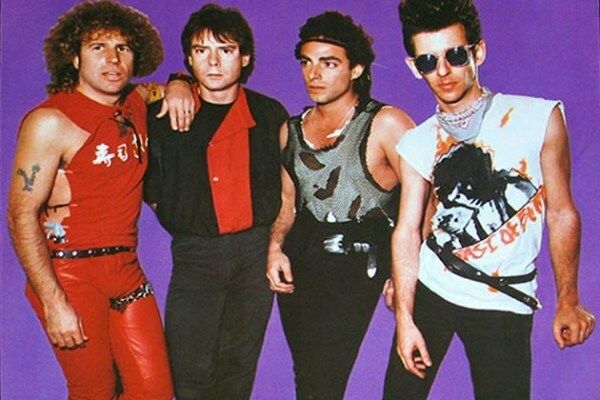 Late in 1983, Sammy Hagar and Journey guitarist Neil Schon did a project together along with bassist Kenny Aaronson and drummer Michael Shrieve. 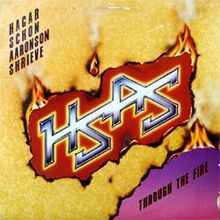 Together, they formed a band called HSAS which was short for Hagar, Schon, Aaronson and Shrieve and the result was their one and only album, “Through the Fire.” Was it a success? Maybe not according to the charts but it made my spring in 1984 and continued to do so for years after. Confession, I never bought the “Through the Fire” album, I cheated. Instead, I recorded their full performance from an MTV concert. Besides, they played every song on the album plus a few songs that didn’t get on it. Having finally listened to the album, I feel no shame as it simply brings back all the great memories of that taped concert. While most trendy types might not remember HSAS, I’m sure that a lot of metalheads and a few non ones do. When Sammy Hagar toured solo at the end of the year and even during his first tour with Van Halen, there were signs around many a concert venue that read, “Sammy Hagar, Top of the rock.” That’s because it’s the best known song from the album. He played it that night I saw him and it is a brilliant song. However, it’s only my second favourite. The top slot goes to the very next track, “Missing You.” That song really cooks and Neil belts out great guitar solo on it. Hearing the next three tracks, I am now convinced that when the band played live, they played all three together as one song. Each track quickly goes from one to the next so you don’t really get a break. Furthermore, all three are in the way out space rock mode and they fit very well together. In the MTV concert, only the title of the first song, “Animation” was introduced but it went on for far longer than the four minutes it says the song lasts on the label. Actually, I am pretty sure that the song lasted for the duration indicated by the three songs. There is one blip in comparing the album with the concert and that comes in the form of the band’s cover of the classic, “Whiter Shade of Pale.” The song closes the concert and I think it was a great song to close the show with. However, it’s not the closer on the album and now I wonder if it should have. It’s still done very well and I think that Procol Harum would have been impressed. After that comes the hard rocker, “Hot and Dirty,” which Sammy stated in the concert that it was about Kenny the bass player’s girlfriend. Can’t fault the song, it’s really good and Neil Schon shows his talent up and down all of it. While not a ballad, “He’ll Understand” is, to quote Sammy, on the tender side. It starts out as a ballad but that changes not far into it and has a smoking guitar solo. The irony is the closer because I am fairly certain that it was the opener for the concert. However, it works both ways. The reason why all nine songs are so good is down to the talents of the four men who comprised HSAS. Sammy’s vocals and Neil’s guitar work were always going to be a lethal cocktail, no doubt about that. But we should raise a glass to the rhythm section of Aaronson and Shrieve because together, they make a fine one. For the last 33 years, I have been asking myself “What if?” What if HSAS went beyond this one project and put out more albums? I think that they would have made a huge impact on the music of metal’s golden decade. History does sort of support me. When Neil went back to Journey, they didn’t make any impact after, at least not on me. Then there’s the case of Van Hagar, although I’ve always said that Sammy can’t be blamed for that. What we are left with is one fantastic album and three decades of me wondering, what if. Next post: There will be no post at the end of the week because I am off to the Download Festival this week. I’m going to rock to Aerosmith, Steel Panther, Rob Zombie, Suicidal Tendencies and many more. Of course I will give you a day by day report once I return. Still no new link for buying Rock and Roll Children direct but it’s still available on Amazon. 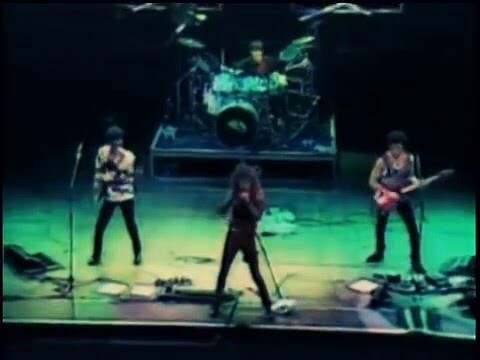 This entry was posted on June 4, 2017 at 7:32 pm and is filed under 1980s, Concerts, Heavy Metal, Heavy Metal and the 1980s, Music, Rock, Uncategorized with tags Aerosmtih, Classic Rock, Download, hard rock, Heavy Metal, Heavy Rock, HSAS, MTV, Neil Schon, Rob Zombie, Sammy Hagar, Steel Panther, Suicidal Tendencies, The 1980s, Through the Fire. You can follow any responses to this entry through the RSS 2.0 feed. You can leave a response, or trackback from your own site. This is a great record all recorded live than they took all the audience off of it except for the last track! Thanks and you’re right about Neil in Journey. His guitar work was always smothered but he shines on this record. I can’t imagine anything sounding as 1984 as this. Just received a copy of this one, ordered shortly after reading your review here. Haven’t yet spent sufficient time with it to opine much, but am grateful for the steer to a cool album I was completely oblivious to.